DEVINE INTERVENTION hits stores in a little over a week, and it's been fun to see reviews from readers coming in. I particularly loved this one by a bookseller in New Mexico, who did not want to read it AT ALL until a painful leg injury trapped her at home. "... a vein in my leg just suddenly gave out, & I was forced to while away a couple days on pain medication. Some higher power was obviously ensuring that I read it. Could have used a less painful method, I think. But I'm glad of the result, at any rate." Also, here's an interview I did with Laurisa of A Thousand Wrongs. In it, I talk a bit about what led me to write the book--and my hope that it includes some of the definitive squirrel mayhem scenes in modern literature. 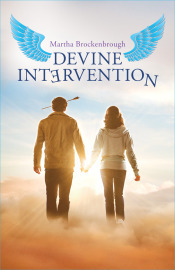 Laurisa and I are giving away a copy of DEVINE INTERVENTION plus a big of fun swag. Read the interview and enter the giveaway here. And you can still pre-order a signed copy from Queen Anne Books in Seattle. We're throwing in The Angel Made Me Do It pins and free Skype visits for book clubs that order multiple copies.